Outstanding breakfast and lunch café in heart of Sorrento Valley/ Mira Mesa business corridor. 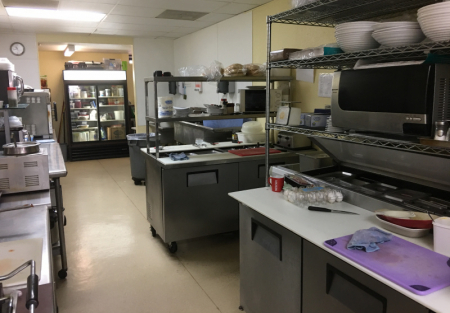 Very well designed and built out Deli.
. Deli/café is in near new condition as majority of the equipment was purchased and installed new in 2012 when the location was established. Café/deli is very popular with local business employees and their online reviews verify that their customers love them. High quality menu offerings draw and keep customers coming in a back for the next delicious special of the day. Business is open Monday-Friday 8:30-2:30; be home by dinner every night if you keep the same hours! Qualcomm campus is walking distance and catering opportunities are huge in this business district. Catering is largely untapped by current owners but with the economy improving local businesses are begging for good catering companies to supply them quality foods. Sales for the past three years have averaged 125k per year. Location is ideal for a husband / wife operation. Kitchen is set up nicely with very well maintained equipment. Hoodless turbo chef oven, refrigerated prep table and induction burner stove all contribute to this well-designed kitchen. Dining area is very nice and has seating for approximately 35 customers. Café has a very noticeable corner location and a patio area with seating for another 20-30 customers. Restaurant space is 1557 square feet with rent of only $1516. Cam charge is an additional 544 per month. Lease expires in March of 2024 with options available to qualified buyers. Current owners have limited hours and are very happy with the results. If you are ready to take this great location to the next level it could be as simple as expanding the hours. If you really want to see this location boom, get to work on the enormous catering opportunities that surround your business.